Since starting in 2003 at a shop on Stokes Croft, posh pie empire PIEMINISTER has gone on to become rather famous, and along the way contributed to the gentrification of BS2 which saw less wealthy local people priced out by trustfunded ‘creatives’ wearing ironic facial hair. Well, they couldn’t afford the pies, so why hang around? 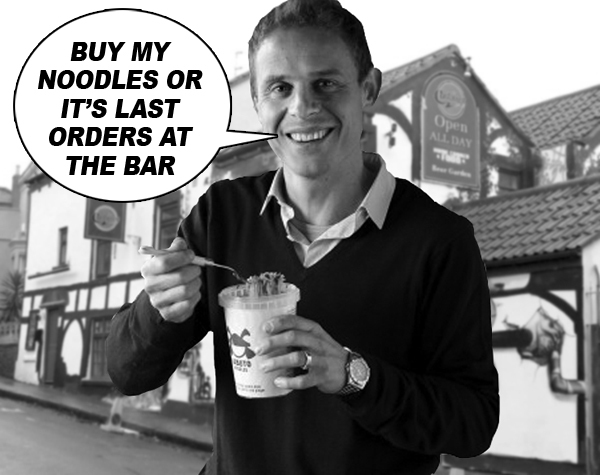 CRISPIN BUSK was Pieminister’s UK Account Manager until he left in 2010 to start up his own upmarket instant noodle business, Kabuto. Whilst his Kabuto noodles lack the name recognition of his old company’s products, privately-educated Cambridge graduate Crispin certainly took on board the Pieminister ethos of pitch-up-in-cheap-area-and-price-out-locals. Having moved in next door to popular Montpelier pub the Cadbury, he decided he didn’t like hearing people enjoying a few drinks and chatting in its much-loved beer garden, so began a campaign of noise complaints to the council. And in a VICTORY FOR BRAYING HOORAY HENRYS everywhere, Busk succeeded in almost getting the pub’s licence revoked – with the lasting result that you can’t enjoy your beer outside past 10pm. This entry was posted in Bad Bosses, News and tagged Cadbury, Crispin Busk, Fork Publishing, Kabuto, Radley College on April 23, 2013 by Jooohn Ag. Ahoy there, shipmates – the latest issue of Bristol’s finest muckraking newspaper is now being distributed across the city as we speak! This edition is packed full of exposés of the overpaid mediocrities running our fair town, with the focus on ‘hands-on but light touch’ MILLIONAIRE MAYOR George Ferguson and his scuttling around overseas at our expenses cooking up development deals with his old business cronies. There’s also the scoop that Bristol City Council has brought in KILLER COMPANY ATOS – notorious for throwing disabled people off benefits – to manage its workers’ occupational health; a report on shady Facilities Management accounting and MISSING MARKETS MONEY; and news that senior officers don’t know how much of our money they’re spending on CUTS CONSULTANTS. Throw in a round-up of how UNION BUREAUCATS are betraying ordinary Bristolians, a look at some of the candidates in the upcoming council elections, the story of the POSH NIMBY who tried to shut down a popular pub, and of course the latest entries from SIR GUS HOYTY-TOYTY’S CABINET DIARY, and you have yourself a super, soaraway scandal sheet! In addition there are copies around St. Nick’s Market, with St. Paul’s, Bedminster, Windmill Hill, Totterdown, Southville and Kingswood all being covered today or in the next few days. Precise locations will be added as they are confirmed. More outlets will be added to the distribution list as they are confirmed, and further drop-offs can also be arranged – just get in touch. Our street team reports back that this edition of The BRISTOLIAN has flown out of their hands so quickly just one day in that they’ve completely run out! To satisfy the city-wide hunger for real news you can trust, we’ve put ordered a reprint, which will be ready for us to hit Hartcliffe, Knowle West, Sea Mills, Cotham, Hotwells – and other areas not yet covered – next week. In the meantime, if you can’t wait to get your hands on a paper copy – or your local stockist has already run dry – download a digital version here. 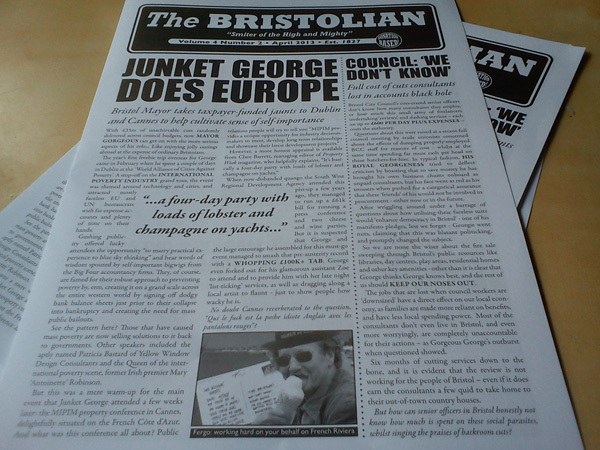 This issue of The BRISTOLIAN was sent to the printers at 4am on Monday. At 11.28am Margaret Thatcher was found dead whilst “reading in bed”. This entry was posted in The BRISTOLIAN Says and tagged Alastair Sawday, ATOS, Brenda McLennan, Bristol City Council, Bristol Trades Council, Cadbury, Chocolate Factory, Crispin Busk, David Bishop, Generator Group, George Ferguson, Gus Hoyt, Guy Poultney, IfB, Independents for Bristol, Janet Maxwell, Jason Budd, Jon Rogers, Karl Belizaire, MIPIM, Paul Isaacs, Pieminister, Rob Telford, Squarepeg, Stephen Perry, SW TUC, Tony Harvey, Unison, Unite, UWE, WACAP on April 12, 2013 by Jooohn Ag.